It's fair to say that the tedium of sitting still for long periods keeping quiet during speeches, posing for endless photographs and watching the adults enjoying themselves can turn even the most well-behaved of children into a whining, screaming tearaway when attending a wedding. Some might say it's the parents' job to apply discipline - but what fun is that when you want to be dancing, drinking and enjoying yourself? Because children’s behaviour can be disruptive and unpredictable in the middle of what’s essentially a formal occasion, some couples choose not to include children when inviting parents to the wedding. If this is what you choose to do, make it clear on the invitation that children are not invited – you can always lie and say it’s for reasons of space or budget if you’re worried about seeming unreasonable. Most people will respect your right to choose and be happy to go along with your wishes – but there’s bound to be a few who can’t understand why their little angels aren’t welcome. If they kick up a fuss, explain that you’d love to have them there, but (for whatever reason) you don’t feel you can accommodate the kids. Anybody who still refuses to comply will have to be struck off your guest list – after all, if they want to flout the rules on your big day, you don’t want them there anyway! It’s not just the children of invited guests that need careful attention on the big day. 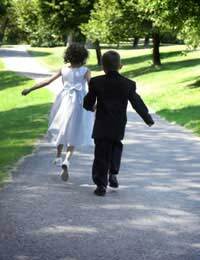 Many brides like to have young flower girls, ring-bearers or pages in the bridal procession – all of whom will need looking after during the service.Chief bridesmaids or best men should assign a bridesmaid or groomsman to each of the younger attendants. Introduce the child to their ‘buddy’ outside the church, and explain that in the event of a problem - if they need the toilet, or aren’t sure where to sit, for example - they should go to that person. (It makes sense for the best man to supervise the ring-bearer, as any failure to get the rings up the aisle will leave him looking very foolish!) Once the procession’s over, the youngsters can be seated with their parents. Parents with particularly young or boisterous offspring are best seated at the back of the church, so they can take the children outside if they start to get restless. Somebody with a good knowledge of the guests – the mother of the bride, for example – can play a useful role in doing this effectively. As a last resort, try small distractions to while away the service. Hand-held games (preferably not beeping electronic ones), or small tubs of unwrapped sweets can keep the little ones amused while mums wipe away their tears during the vows. It’s a good idea to have a designated ‘children’s table’ at your reception. For starters, placing a table at the back of the room will mean youngsters can get up and race around without causing disruption to other diners. The table can be laid with kid-friendly crockery and glassware rather than anything you don’t want smashed. As a rule, children aren’t shy about being sat around a table with a bunch of kids they don’t know, and will probably have more fun this way than on their best behaviour with the grown-ups! Having said that, parents need to know where their child is sitting and vice versa. This allows any shy or anxious youngsters to find their parents without fuss, while mums and dads can make a beeline for any kids whose behaviour gets out of hand.Provide some activities for kids to do while they’re sat at the table waiting for speeches to be over. A box of toys under the table will placate very young children, while a jug of pens and pencils in the middle of the table, combined with a white paper tablecloth, can provide older kids with hours of fun. Encourage them to draw pictures of the day and sign them. As long as there isn’t too much spilled food on it, the end product can make a great souvenir. The more activities you can lay on for kids during the day, the less likely they are to get bored and cause disruption. Seating kids near the back at the reception will also allow them to slip out and join in with whatever fun’s going on outside the dining hall. Bouncy castles are a popular option at summer weddings for those with the space and budget to hire one. Children can return to it as often as they like, which should allow them to expend all the energy they’ve acquired from cake and sweets. Beware, however – adults often find bouncy castles an irresistible temptation and kids may end up struggling to find room!A magician, clown or children’s entertainer can provide youngsters with a very welcome distraction for a couple of hours. However, sitting down watching tricks will only hold the attention for so long, so it may be better to book them to coincide with events such as the ceremony or speeches. Finally, professional crèche organisers can cater for children up to 13 or 14, providing entertainment from dolls and ball pits to dance mats and Playstation games. They’ll always be trained childminders and will usually be available for a full day’s work, meaning the children can enjoy themselves to the full while the adults let their hair down.